A herbal goat mix with alfalfa, which has been found to be especially suited to shy feeders. Hay or roughage will form the basis of the diet. Adult goats will usually eat at least 1-2kg of hay a day, and milkers will often need nearer 3.5kg of hay a day. Goats are highly individual and these are only guidelines – adjust the quantity fed to maintain each goat in the best condition. Make any changes slowly and introduce concentrate feeds gradually. It is usual to split the total amount into two or three feeds. 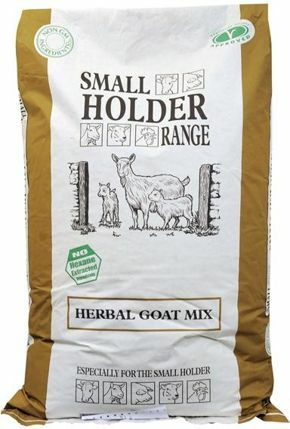 Maintenance – adult goats that are not milking will usually need 0.5-1.0kg of mix per day. Milking and In Kid Goats – Introduce Dairy Goat Mix 1-2 weeks before the kids are due to be born. Start with just a handful and increase gradually so that by the day of the birth you are feeding 0.5kg a day. After the birth, slowly increase the quantity of Dairy Goat Mix to about 2kg a day. A milker producing 4.5 litres (a gallon) a day will usually require 2kg of mix. For those producing more milk than this, it may be necessary to increase the amount fed up to 3kg, although not all goats will eat this much. Kids – the newborn kid will get all its nourishment from its mother’s milk. Introduce feed gradually and in small amounts. By the time they are two weeks old, kids will already be starting to nibble at solid food. Offer small amounts of mix for them to pick at, as well as good quality hay. This can gradually be increased so that by the time they are weaned (usually at about three months) they are eating at least 0.4kg of mix a day.